We love the town of Iraklion Crete. It has the best of Greek and Cretan life to offer, and we are happy to share our favourite places with you. Iraklion Crete ~ Ηράκλειο is a busy and prosperous modern town, the capital of Crete, with a thriving population over 150,000. It sits on the north coast in the centre of the island. The traveller will find much to see and enjoy in the town, and friendly hospitality of the Cretans very much alive. We are biased, being from Iraklion; after spending a lot of time in the town, we can tell you about its nooks, crannies and little surprises. 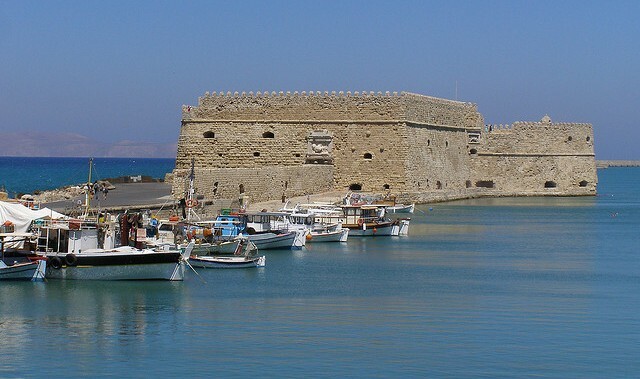 Iraklion Crete town shares the turbulent history of Kriti, with occupation dating back to Minoan times. It was inhabited by Saracens, pirates and Arabs in the early days. In AD961 a Byzantine era began, until 1204 when Crete was sold to the Venetians. The Turks took over the flourishing city after a lengthy siege in 1669 and dominated until liberation in 1898. Crete unified with Greece in 1913, Iraklio suffered bombings in the world wars and played her part in the Battle of Crete in 1941. Becoming the capital in 1971, Heraklion town is now one of the most expensive capitals in Greece, and was a proud Olympic city in 2004. The beautiful harbour is notable for its fishing boats and fresh fish, surrounded by Venetian walls, fortress and Venetian Arsenal. The Castello del Molo was built in 16th century, with reliefs of the Venetian lions (Lions of St Mark) still visible, and is now used as an open air theatre in summer. Iraklion Crete - arrive via the Heraklion International Airport HER, which is only 5 km from town, see the location on the map below. There are many flights per day from Athens with both Aegean and Olympic Airlines. Many international flight arrive from all over Europe daily in summer. Tips and info about the airport and transfers here. Iraklion Crete - the major plateia or square is Eleftherias, named after the Cretan leader and diplomat responsible for the unification of Crete and Greece in 1913. This is a broad and imposing plateia with graceful eucalyptus trees, ringed by tavernas and cafes a little on the touristy side. 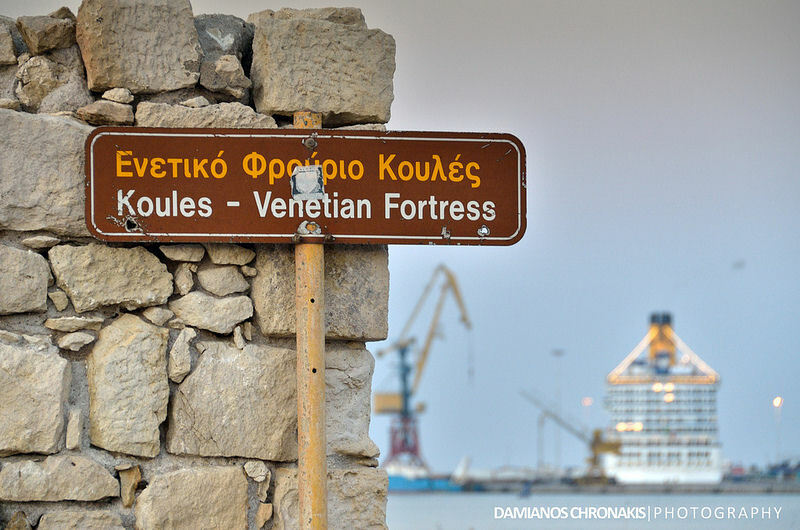 There is a statue of Venizelos of the eastern side of the plateia, with a good view to the port below. Just off this plateia is the famous archaeological museum which houses most of the antiquities on the island, including most of the treasures from Knossos. The ancient Minoan Palace of Knossos is located 5 km from Heraklion and is unique as the birthplace of civilization in Europe. The archaeological museum of Heraklion is well worth the visit, especially in the winter as you can avoid the press of tourists coming in droves on coaches. Try to avoid the touristy shops around the parking lot of the museum. 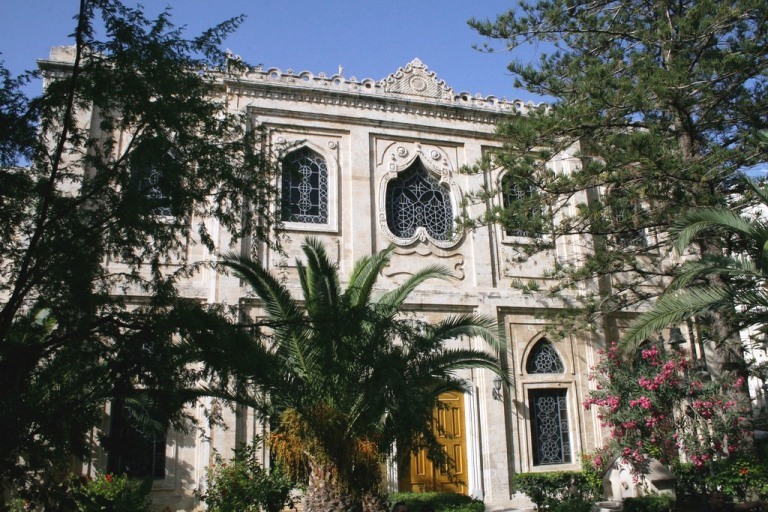 More on the museums of Heraklion. Around this plateia and running from it are the major shopping streets of the town, including the pedestrian Dedalou. If you follow this street, you will come to the Plateia Venizelou with the Liondaria. The Morosini Fountain, named after its Venetian designer, is more commonly known as the Liondaria, after the many lions in its design, and its little plateia forms one of the hubs of the town, a handy place for meeting up with friends, "I will see you at the Liondaria in an hour". From the Liondaria, through the many busy cafes and lovely shady trees lies Chandakos Street, a very atmospheric interesting shopping street. Behind the Liondaria, through another interesting pedestrian laneway, lies El Greco Park and plateia. Along from the Liondaria is the laiki agora local market, which runs the length of 1866 Street and is well worth the visit. Everything you could want is sold here, and there are interesting restaurants amongst the stalls. Look out for the organic produce and local spirit, tsikoudia, as well as local honey and wine. If you walk the length of the agora, you will find yourself in another plateia Kornarou, named after the writer of the exquisite Cretan poem Eritokritos. 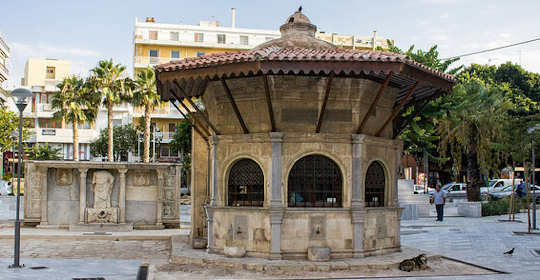 In this plateia are the disfigured Bembo Fountain (above and below) from 1588 and a Turkish fountain from 1776 now used as a coffee house (pictured below). All around this plateia are excellent shops and side streets with good shopping, for the locals. 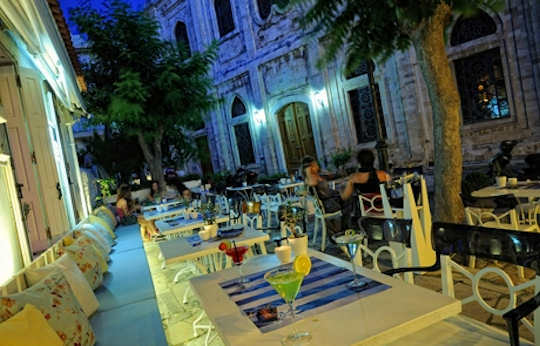 Highlights of Iraklion Crete include the many skinny streets of Koraii with stylish café after café after restaurant, all full of the social, fun-loving Irakliotes. Most visitors access Iraklion from the harbour, walking up the hill from the port or walking around the Venetian harbour along 25th August Street towards the Liondaria. 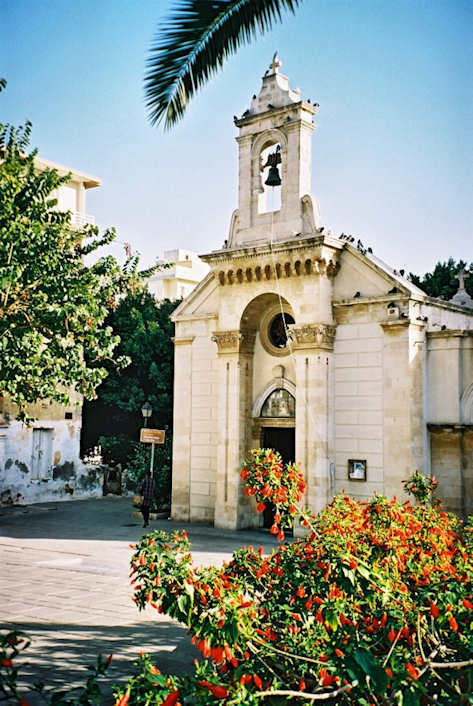 As you pass along this street you will notice the striking church called Agios Titos (above), with its own expansive plateia. There is a great modern bar café next door with a pleasant courtyard. Also along this street are newly restored Venetian mansions as lovely examples of neoclassical architecture with gorgeous ironwork balconies. On the left you will come across the Venetian Loggia, from 1628, which is an impressive building now housing the Town Hall. Iraklion Crete - behind the Venetian loggia, as you walk down the street you will find internet cafes and an organic food store. There are many good local food shops at the intersection of August 25th and Kalokeri Streets. Close by is The Body Shop, another handy landmark, as the bus ticket booth is opposite, and the buses stops there too. There is an excellent newsagency near the bus ticket booth, and local cafes nearby. Don’t forget to get your fresh bougatsa from the shop nearby, the freshest in Iraklion. Locals shop all along Leoforos Kalokerinou and it is worth a walk as it is truly authentic Iraklion. Pop down a laneway and come into Plateia Agias Aikaterini behind the other city church of Iraklion Agios Minas (right) from 1862.This plateia has some lovely relaxed cafes. 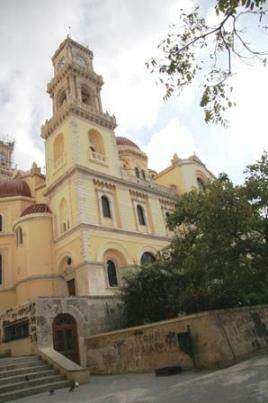 Next to Agios Minas, you will see the original small Agias Minas and Pantanassa (left) from the 18th century. This is a gorgeous little atmospheric church and as it was on my morning pathway, just next to my bus-stop, I used to pop in and light a candle and send love, as many locals do. 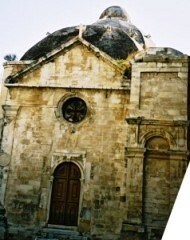 Also on this large plateia are the Church and the Museum of St. Aikaterina (left). Sit under the leafy trees, have a kafe and watch the world go by. Further down Kalokeri, is the old town wall. The Venetian walls are high and impressive, and mark the edge of the old town from 16th century. The city walls have 7 bastions and 4 gates. The gates have various names and still form important landmarks. The road to Chania, for example, goes through the "Chanioporta". The KTEL bus station on the outside wall of Chanioporta serves as a hub for many bus services running to the south and west of the island. "I hope for nothing, I fear nothing, I am free". We love relaxing on the open air terrace of the Veneto Café on Epimenidou Street, and watching the twinkling lights of the harbour below. The café bar Breeze by the water front is a great local spot with all tastes catered for in a very modern club atmosphere. 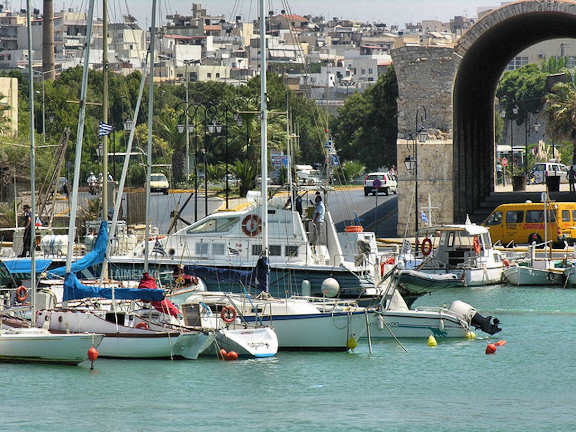 The Marina Café, opposite the fortress and overlooking the freshly arrived yachts in the harbour, is wonderful for a coffee day or night, and really has to fall into our category of great cafés by the water. Dish Bar Cafe is in the middle of the busy city, back from 25th August St. With its private courtyard next to Αγίου Τίτου Agíos Títos, one of the largest city churches, and looking over the expansive plateia with its shady palms, this café is one of our favourites in Iraklion town. Any café bar in the centre of Koraií, it is so big and central you can’t miss it. I love it because there is always somewhere to sit that suits my mood, either alone for a quiet coffee, or a table with friends. Be sure to drink here, even if it is just to drink in the local vibe. This is a great central meeting point to start out your night. Watch out for high prices but great service. 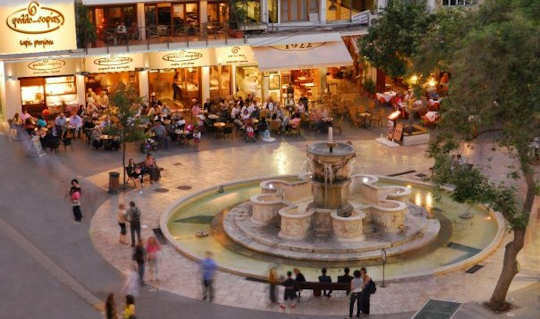 Chances are, when you are in Iraklion town, that you will visit or meet friends at the Liondaria. This Venetian fountain is the hub of the town, and very popular with tourists. The little plateia around the fountain gets very full, and all the cafés around it too. There are some lovely big trees and cooling shade; one of our favourite cafés is just a step behind all the madness, down a little laneway called Katanoléon. News Café Bistro is one of our favourites because of its location, service and coffee. It is a modern café, with friendly atmosphere. Usually you have to jostle for elbow room. There are seats outside in the laneway, which is our favourite spot. Here we can gaze out across the large plateia El Greco, and watch the world go by. The shopping here is excellent; within the journey from the Liondaria to Street Café you will find your SIM card, exotic jewellery, haute couture, stunning home wares, a wonderful bookshop and a fine bakery. Just next door is the Greek telephone office OTE and also another of our favourite shopping streets, Handakos. There is so much more to see in Iraklion town. Enjoy your visit to this thriving cosmopolitan town. If you live in Iraklion town, you will recognise many of the landmarks mentioned here. Tell us about your favourite part of town. There are plenty of hotels, rooms and dolmatia in Iraklion town. My favourite is Hotel Lato with its perfect view of the old harbour and excellent service. One of the most spectacular ancient sites in all of Europe is at the doorstep of Iraklion Crete. Dating from 2000BC, this Minoan palace and city now 5 km from the town, was the birthplace of European civilisation. 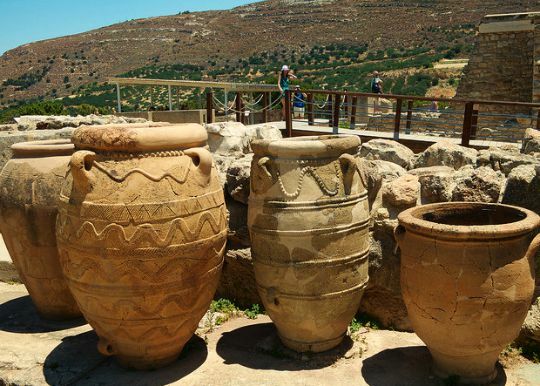 A quick bus ride from town into rolling hills covered in olive groves and vineyards, Knossos Palace is an intriguing and beautiful site to explore. It does get incredibly crowded in summer, and many coach tours include it in their journey, so aim to visit in spring or autumn or at least very early in the morning. It is a very big palace and city and is a lot to take in, so perhaps two or more trips are needed for those lovers of ancient history. 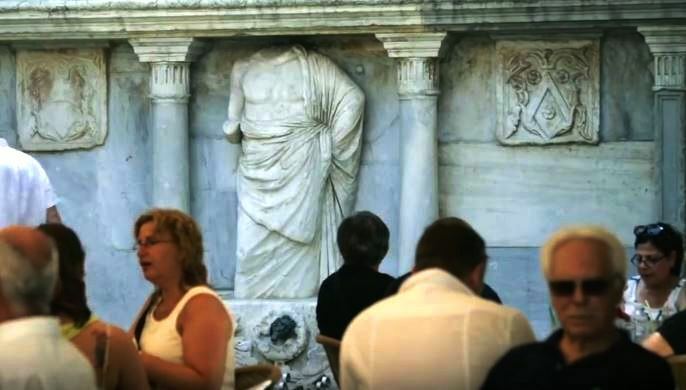 In the following video you will see plenty of Heraklion with the old harbour, the Venetian fortress at the harbour, the huge old town walls and gates, the Palace of Knossos, some of the significant Minoan artifacts held at the Heraklion Archaeological Museum, such as the snake goddess, the Phaistos Disk, double headed axes and beautiful frescoes. See scenes from modern life such as the fruit and fish markets, cafes and beaches and the large modern port. 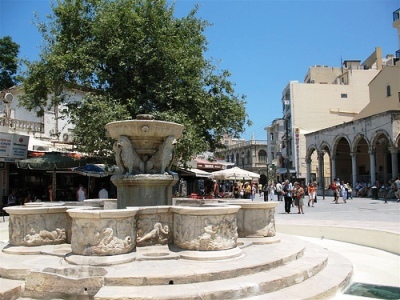 See the cathedrals of Heraklion, the Venetian loggia, the famous 'Liondaria' fountain, architecture and parks and plateias. In the video below you will see the town of Iraklion Crete as well as the diverse and spectacular region of the same name, this is a visual feast with aerial photography of mountains, beaches, agricultural lands and ancient sites all blending to give a real sense of place. Iraklion Crete - there are direct flights from many different hubs in Europe as well as 1 hour flights with Aegean or Olympic Airlines from Athens. 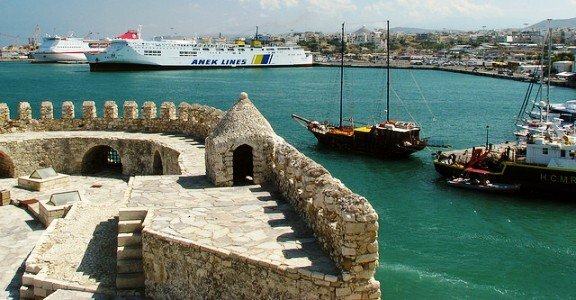 Take a 9 hour ferry from Pireaus port of Athens, all details below.